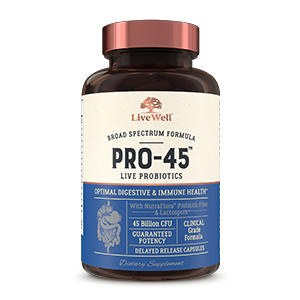 LiveWell Pro45 Probiotics contains 11 probiotic strains. According to LiveWell Labs website, 10 out of these 11 strains list their specific substrain. The strains used are acid and bile resistant and have the ability to colonize in your gut. 100 mg of NutrFlora prebiotics are used in their formula. Pro45 offers 45 billion live cultures per dose. This is not the highest potency we’ve seen but it is well within our recommended amount. LiveWell-Labs is a well-know brand with a positive reputation. However, this newer product has very little customer feedback. It’s also not endorsed by a doctor like our first choice. This has pushed it to our third place on the list. Live-Well Labs is a very well-know brand in the health and wellness community. The positive reviews, guarantee and ingredients puts this product in our 2nd place position. This formula offers a great number of clinically studied probiotic strains and does contain prebiotics, but this company is still relatively new in the probiotic space.